County Road S-6 makes a number of S-curves southwest along South Grade Road from Palomar Mountain to California 76. This view looks from the intersection of Crestline Road and CR S-7 (East Grade Road). Photo taken 11/10/12. San Diego County S-6 constitutes a lengthy route from Historic U.S. 101 (Camino Del Mar) at Del Mar east along Via de la Valle away from the Pacific Ocean. The county road initially passes by Del Mar Racetrack and connects Del Mar and Solana Beach with Interstate 5 as it skirts northern reaches of San Diego. Following a winding course alongside the San Dieguito River, CR S-6 continues to Lake Hodges and Escondido via the busy Del Dios Highway. Through Escondido San Diego County S-6 takes a slightly jagged route through Downtown, with eastbound traffic using Valley Parkway and Second Street. Westbound traffic stays on Valley Parkway, which has a one-way segment through the business district. Valley Center Road leads the county road northeast to Valley Center and Rincon Indian Reservation. 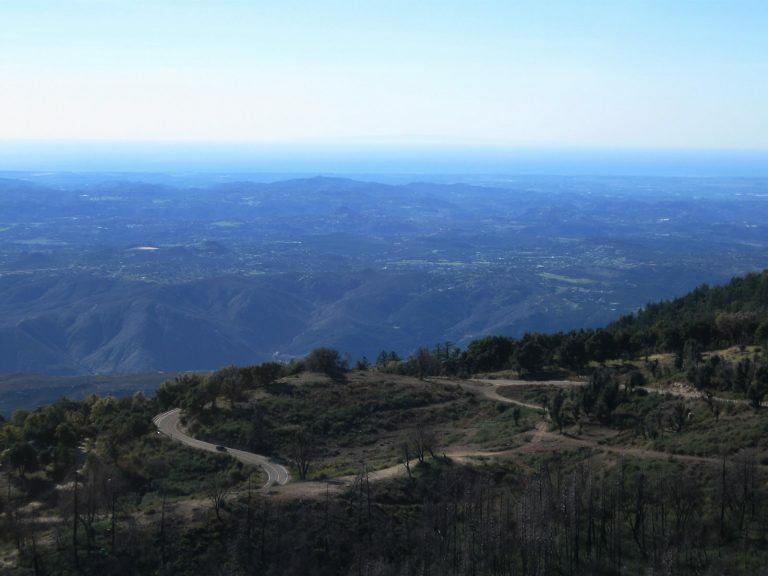 Beyond a five-mile overlap with SR 76, CR S-6 curves north onto Palomar Mountain. 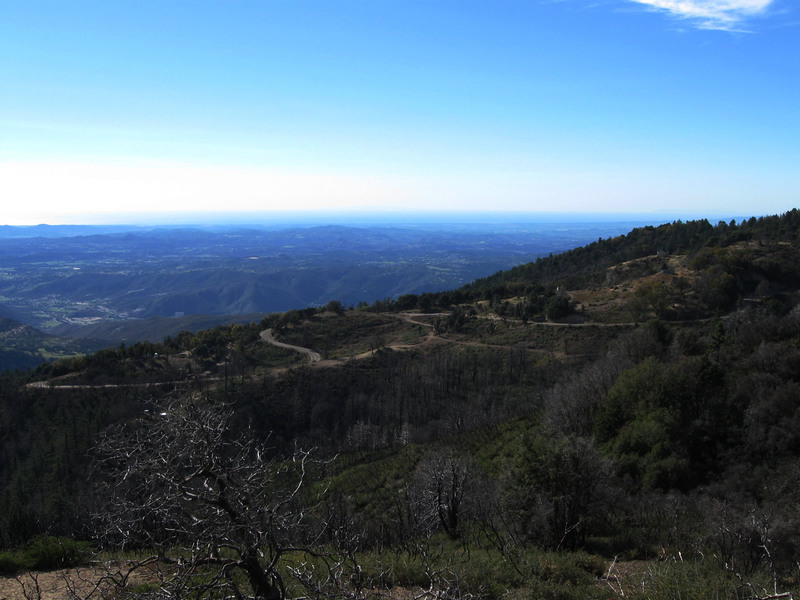 One of the primary tourist attractions along San Diego County S-6 north is the Palomar Observatory, which is owned and operated by the California Institute of Technology (Caltech) astronomy program. The observatory has limited hours (fewer in the winter) and is famous for its 200-inch Hale Telescope, 48-inch Samuel Oschin Telescope, and 18-inch Schmidt Telescope. The site of the observatory was selected in the 1930s to be away from light pollution that had made nighttime astronomical views difficult at an observatory at Mt. Wilson near Los Angeles. CR S-6 and CR S-7 leading up Palomar Mountain, were improved around 1936 once design and work began on the observatory on top of Palomar Mountain. Construction on the dome occurred in the same year, and the mirror needed for the telescope was manufactured in the ensuing decade. The observatory was dedicated on June 3, 1948. The Palomar Observatory building and grounds. The observatory is home to a visitors center, museum and a gift shop. Free to visit during business hours, there is a display inside the observatory that explains how the equipment required for it was transported onto Palomar Mountain. Photos taken 11/10/10, 06/16/06. The Del Mar Fairgrounds, which is used for several popular events every year, including the San Diego County Fair and the Del Mar Thoroughbred Club horse racing. Photos taken 08/18/12.